Platinum ITS is a leader in the design and construction of award winning networks. From small home networks to large enterprise networks, Platinum ITS has the experience and resources you need to either build out new networks and revamp existing ones. Most vendors wear blinders and only can see the small picture and focus on a single task. Platinum ITS has the background and track record of building network after network. What makes Platinum ITS a leader over other IT companies? 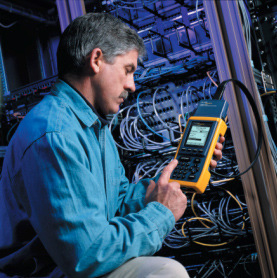 We look at installing only proven, reliable hardware, done right. From Cat6 certified installers to Fiber installation, Platinum ITS is an expert in properly running these mediums. Historic buildings? Long distance applications? We do high powered wireless solutions that apply where physical mediums are impossible. What else goes into a network foundation? Best bet is that any other IT company would not mention half of these items when quoting out a solution. Contact Platinum ITS today to learn more about how to properly secure and build out your network infrastructure.